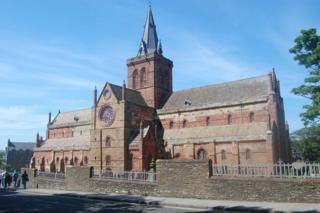 A 12th Century cathedral in Orkney is to undergo a laser scan as part of efforts to preserve the building. The project, which will record every last detail of Orkney's St Magnus Cathedral, is to begin later this year. Orkney Islands Council is currently looking for experts to carry out detailed scans of the internal and external structure of the cathedral. A 3D record of the building can then be compared with future scans to detect any changes in its fabric. It will allow for analyses of weathering, erosion, decay, moss build-up or shifts due to subsidence. It is also hoped the scans can be used to aid research and enhance tourism by developing digital tours of the cathedral under separate proposals for a major exhibition on the history of Kirkwall. The Society of the Friends of St Magnus Cathedral have given the project their backing, committing to contribute half of the costs of the laser scanning. The society's secretary David Oddie said they were delighted to be contributing. He said: "It goes right to the core of our chief aim - protecting and safeguarding the condition of this majestic building. The joint funding of this work is a reflection of the good relationship we've had with the council for many years." The Romano-Gothic cathedral, built from red and yellow sandstone, is of international significance. The foundations were placed in 1137, and the building, dedicated to Magnus Erlendsson, Earl of Orkney, took about 300 years to build. It was assigned to the inhabitants of Kirkwall by King James III of Scotland in a charter dated 1486.